1 in 5 High School athletes will get a concussion and more than 2.5 million young people suffer a concussion in the United States each year. With proper care, most concussions can heal within 10 days, but the overwhelming majority of students, parents, and coaches are unaware of the latest science about the prevention and treatment of concussions. If not treated properly, a concussion may have lasting physical, emotional, and cognitive effects. 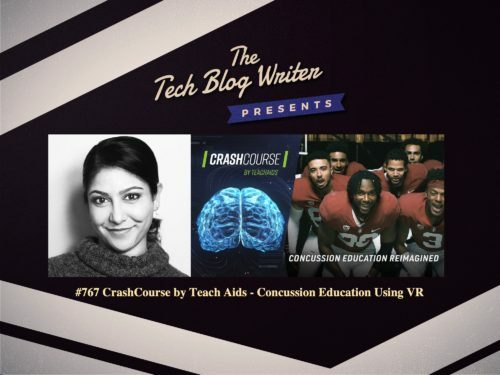 After two years of research, six months of production, and thousands of hours of user-testing, CrashCourse by Teach Aids provides students, parents, and coaches with the latest medical knowledge on the prevention and treatment of concussions. I wanted to find out more about they are also using cutting-edge, immersive experiences in VR to appeal to a digital native generation and demonstrate increased empathy and learning. So I invited Dr. Piya Sorcar onto my daily tech podcast to learn more. Dr. Piya Sorcar is the founder and CEO of TeachAIDS, a Lecturer at the Stanford Graduate School of Education, and an Adjunct Affiliate at the Stanford School of Medicine. She leads a team of world experts in medicine, public health and education to develop software that solves numerous persistent problems in HIV prevention. Founded at Stanford University, TeachAids is a nonprofit social venture that creates breakthrough software addressing numerous persistent problems in health education around the world. TeachAids uses a research-based design process to develop medically-accurate, pedagogically-grounded, and culturally-tailored animated software to optimize learning and retention in 82 countries.